Kohlrabi are called cavoli in Sicily (in Italy cavoli are cauliflowers, cavolo verza is a cabbage). Just to confuse things, Sicilians call cauliflowers broccoli. As well as the purple coloured roots there are light green ones; the root is always sold complete with the leaves and the whole plant is eaten. Kohlrabi can be eaten as a vegetable – boiled with a dressing of extra virgin olive oil, salt and pepper and a squeeze of lemon juice, but mostly they are cooked with pasta. The kohlrabi I am able to buy at the Queen Victoria Market are always much bigger than the ones in the photos (from market in Syracuse) but unfortunately only one stall sells them complete with the leaves. Because the plant is picked when large, the leaves are not as tender. Still, it is better than nothing, and the broth- like pasta dish I make with them tastes rather good, although I could never say that it is as tasty as the one my relatives in Ragusa make. For a start, they make it with home made pasta (called causunedda) and they also put in strips of cutini (cotenne in Italian, pork skin in English) to flavour the vegetable broth. The cutini (from fresh pork) are common in Sicilian cooking especially in Ragusa. They are eaten stuffed, rolled and braised as a secondo (main course), but mainly added to soups (especially pulses) and always as an ingredient to make a strong sugo to dress pasta or the ravioli di ricotta (a local specialty from the south eastern part of Sicily). The recipe could not be simpler. In the feature photo above and below is Franca, my cousin in Ragusa and she is preparing causunnedda – Sicilian homemade short pasta. Because I do not make my own causunnedda, I buy gnocchetti shaped pasta or pasta or casareccia. Clean the greens and separate them into manageable pieces; peel the kohlrabi root and cut into bite sized pieces. Boil them in salted water (add strips of fresh pork rind if you wish). The water will be used as the broth to cook the pasta so calculate the amount of liquid carefully. When the vegetables are soft, drain them, but save the water and the rind. Cook the pasta in the water. Return the vegetable to the water and the pasta. Add chopped chilli or chilli flakes. Now for one of the most important parts: dribble with your finest extra virgin olive oil and serve. It should resemble a wet pasta. Grated pecorino is placed on the table as an option – I prefer it without. I like the fresh taste of the vegetables and the oil. The Ragusani also cook the causunnedda with dried beans (in winter). The causunedda are also cooked in the same way using fresh borlotti beans (when in season) and in spring with fresh broad beans. These are cooked without the kohlrabi (which is an autumn – winter vegetable). It is amazing how something so simple can taste so good. I just finished reading The Lost Ravioli Recipes of Hoboken by Laura Schenone. I loved the book, and reading it made me think of our own ravioli from Ragusa where I was born and my own search for authenticity since my mother made the filling with ricotta, sugar and the grated zest of an orange, and served them with our rich pork ragu’. Although admittedly an acquired taste, our family will have then made in no other way! I was delighted to have found your blog. My Nonna Concettina made “gniucchitti” in Ragusa, dried them, and mailed them to me in a cotton bag with the mailing label pasted on the cloth. I live in New Jersey USA. 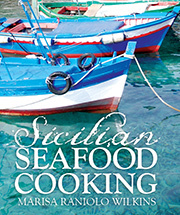 I’m the author of “Sicilian Feasts” which features the recipes of my family in Ragusa, and “Language and Travel Guide to Sicily” which includes 2 CD’s of the dialogues I’ve written for the book recorded in Sicilian (Ragusano to be exact) and Italian. You know that we are teased that they stole our “H” since so many words that are pronounced with a “CH” sound we pronounce with a “CI’ sound like: Ciavi for Chiavi (Key) Ciusa for Chiusa etc. I’m delighted to have met you through your very interesting blog. I do have your book and I am delighted to meet you as well.I even ordered a copy for my brother who lives in Adelaide, South Australia. Last time I was in Ragusa I discussed your book with my relatives and wondered if they knew people with the same surname….and they who seem to know everybody, did not know anyone with your surname. Small world. I must investigate The Lost Ravioli Recipes. I find it very strange that as I am remembering the ravioli of Ragusa, I can taste them!! Smells and tastes do stay with me. Does Laura include them in her book? last time I was in Ragusa there was much discussion on the addition of marjoram – some do, some don’t add it to the ricotta. people in Modica tend to favour it.Aren’t the variations great!!! I will be in Palermo/ Alcamo/ Castellammare next month and I am looking forward to meeting Mary Taylor Simeti. 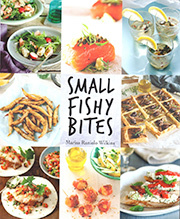 I have written a manuscript with a fish focus – Sicilian fish recipes( primi, mains, sauces , contorni that go with fish), but in spite of the positive comments, I have had no success in Australia – fish is too narrow ).Lots of research, lots of pleasure!! Molto piacere di conoscierti Giovanna. STOCKFISH and SALT COD -The differences between stoccafisso and baccalà and recipes.